LT Enterprise is Responsive Joomla template tailored for Image Design or Creative websites. The template includes elegant images that will provide high quality design services for your business and make your products more beautiful. In addition, this theme is the best way to present your studio and some professional designs that will capture your attention. 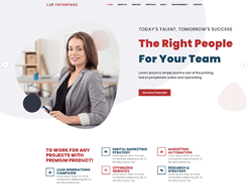 LT Enterprise builds on powerful framework with 100% responsive layout (support for mobile devices) based on Bootstrap CSS grid layout, Page Builder for layout, Shortcode for present content easily. It also comes with 4 color schemes but in fact it is really customizable has drag-drop tools and color settings helping to create excellent websites with various layouts.